Although some people love their scars because it makes them look tough, or so they think, most of us don’t really like the appearance of scars, especially scars on our face or other highly visible places. There are many professional cures, lotions, and creams available on the market that help to heal scars. However those are very expensive, loaded with chemicals, and often don’t give the desired result. Treating the scar while it’s relatively new is the best option to achieve the best results. Old scars are difficult to remove completely and often require a medical approach such as surgical scar revision or laser treatments. Concentrated vitamin E oil, vitamin E lotions, or the contents of vitamin E capsules can directly be used on the affected area. Let set for a while and repeat twice a day. Make sure the wound has fully healed, as vitamin E can interfere with the healing process. You could combine the topical use with daily internal vitamin E supplements or add more vitamin E rich foods to your diet (like almonds, hazelnuts, olive oil, and sunflower seeds) for a better effect. Aloe Vera is truly a super plant as it comes to natural healing. 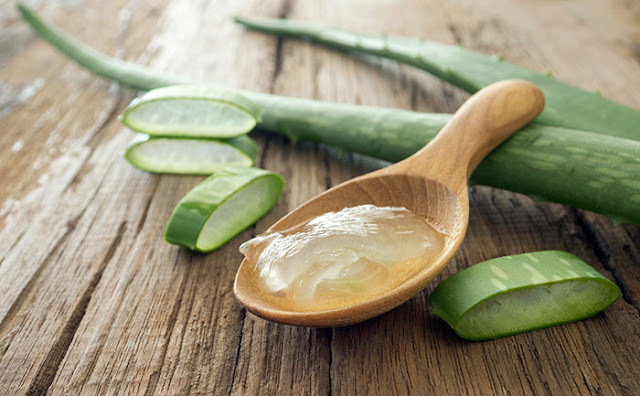 Its gel is rich in healing nutrients and can be used on wounds as well to speed up the healing process and prevent scarring from the beginning of the wound healing process. If you have this plant growing at home, just take a limb and scoop out the fresh healing gel. No plants at your house? No worries, you can buy pure, organic Aloe Vera gel at your local health store. Massage the gel on the affected area and let set and soak. Don’t wash the gel off, your skin will absorb it completely. Repeat 3 times a day or as often as needed. Making a paste out of cucumbers is easy and cheap. There are also commercially cucumber lotions and paste available at your health store. Cucumbers nourish and hydrate the affected area and help to fade the scarring. They make your skin softer and suppler, and are unlikely to cause allergies or skin irritation. To make the paste, peel and remove the cucumber seeds. Blend with a few mint leaves. Beat egg white separately and add this to the mixture. Apply the paste on the scar and let set for about 20 minutes, rinse with cool water. Amla paste is an old Indian remedy to prevent scar tissue. The best effect is obtained when you use the paste on newly-healed wounds. You could buy a ready-made paste or the powder to make your own paste. Mix the powder with water or olive oil for a better effect. Massage the paste into your skin, let set for a while and rinse with cold water afterwards. Honey, another wonder of nature, is used in many natural healing remedies. Apply raw honey on your scar before going to bed. Leave on overnight and you’ll start to see the difference and fading of the scar after just a few days. o avoid a sticky mess on your sheets, cover with band aid, if possible. Its moisturizing and antiseptic benefits are very effective to treat wounds, soften your skin, and stimulate the growth of new tissue. Citric acid is very effective to fade scar tissue, it works as a natural bleach, stimulates the formation of new tissue, and improves elasticity of your skin. First of all make sure to clean the affected area. Apply freshly squeezed lemon juice, twice a day, on a cotton ball and rub onto your scar. Let sit for about 10-15 minutes and rinse with cool water.